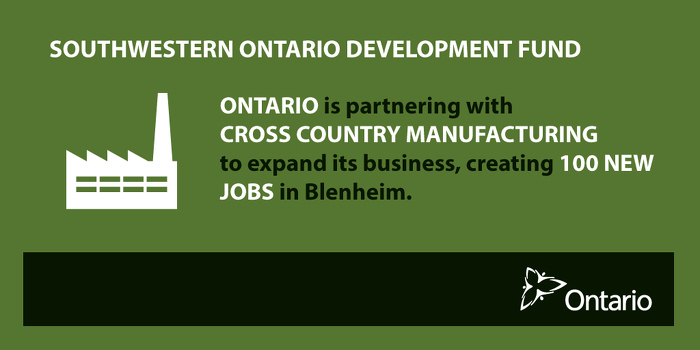 October 13, 2016 9:00 A.M.
Ontario is partnering with Cross Country Manufacturing to expand its business, creating 100 new jobs in Blenheim. Cross Country Manufacturing is a leading manufacturer of premium quality trailers and serves industries such as agriculture, infrastructure, construction, oil and gas, logging, and mining. With support from the province, the company will expand its Blenheim facility. Funding will also help increase quality and efficiency with the introduction of new, innovative projects to increase productivity. The project will help increase revenue annually, and increase export capacity by 70 per cent. Investing in manufacturing is part of our plan to create jobs, grow our economy and help people in their everyday lives. Ontario is investing $550,000 from the Southwestern Ontario Development Fund for this project. The project has a total value of more than $5.5 million and is expected to be completed in summer 2017. Since 2013, the Southwestern Ontario Development Fund and Eastern Ontario Development Fund have helped to create and retain more than 32,100 jobs and attracted approximately $1.58 billion in investment. The funds cover up to 15 per cent of eligible project costs, with the recipient company funding the remainder from its own resources. Ontario’s five-year, $400-million Business Growth Initiative is helping to grow the economy and create jobs by promoting an innovation-based economy, helping small companies scale-up and modernizing regulations for businesses. This document was published on October 13, 2016 and is provided for archival and research purposes.